I have lived in Alabama, New Orleans and Austin, Texas, so I think I know a thing or two about spicy food. 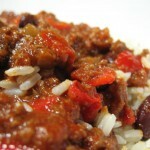 I also know that chili has only one ‘l’ and refers to the dish whereas the fruit is properly spelled “chile.” Okay, on with the review. The box has a lot of verbiage (quoted above). Most of the Tesco meals don’t go to such lengths to describe themselves. The “green jalapeño chilli” refers not to the fruit, but to some sort of preparation made with jalapeños, bay, cinnamon and cloves. The “chipotle sauce” is made from chilli powder (presumably chipotle) and yummy malic acid. This meal has a lot of ingredients, but the end result is pretty bland. 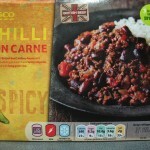 Not sure where the “extra spicy kick” comes in when Tesco admits the meal is only mild. It hits some of the right flavor notes but it’s just not complex or spicy enough. Nutritionally it’s not bad with only 10g of fat and some fibre. More than half the calories come from the rice, so you could replace it with brown rice to get more fibre (e.g. Tilda microwaveable brown basmati rice is quite good). I use Wolf Brand Chile, about one Euro per can. We had friends who put Wolf chile in their luggage when they flew from Texas to visit their son in Brussels.